I’ve previously addressed the notion that we need to “dump SALY” which is essentially abandoning the “same as last year” approach to business. 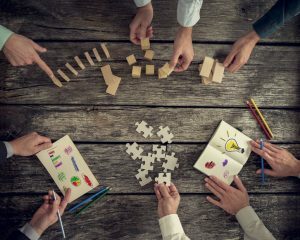 With busy season in the not-so-distant future, perhaps it’s time to cultivate creativity in not only yourself, but your team in order to make things more efficient, productive and happier. How? It all starts with ideas. Ideas indeed have the potential to shake the world. If you want to change things, you have to flex that creative muscle. But how do you encourage this idea-sharing environment? Especially in a traditionally left-brained profession – how can you make sure the right brain is present? Improv. You need to employ the improv principles I’ve presented until it becomes second nature. The elements of improvisation—trust, support, respect, listen, focus, and adapt, along with “yes, and…”—when working together, will go far to enhance your ability to adapt quickly and appropriately. It’s a matter of attitude, and each day we need to strive to get those pieces in place. When you choose to embrace and practice improv, it’ll dramatically affect your workplace environment and it will have a contagious result. However, it will take constant practice on your part – to the point where you can’t stop doing it. You will believe in yourself and your abilities, and that confidence will propel you to even greater excellence and encourage others to share and feel comfortable in contributing. When it comes to understanding and applying improvisation, people sometimes tell me, “this is too simple, Pete.” And the thing is, I agree; it is simple. It’s supposed to be simple. The most powerful concepts are not all that difficult to grasp. You can use improvisation and “yes, and…” to encourage creativity and ideas that will go on to change the world. You can use it to inspire and include others in your workplace, your marriage and family, and all your relationships—it works at all levels. Allow those in your life – especially your team members this busy season – to benefit from the practiced principles of improv. Consider a team exercise. Sign-up to receive my weekly challenge designed to help you and your team find creative ways to build new habits and improve the way you communicate. Let them enjoy the freedom of sharing ideas that will take your business and relationships to new heights!